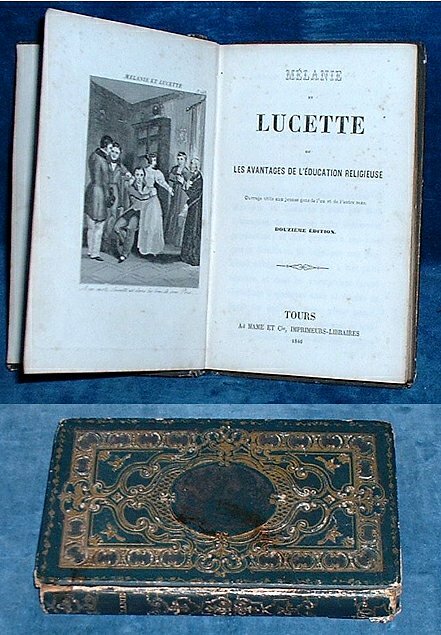 Title: MELANIE ET LUCETTE ou les avantages d’une éducation religieuse Ouvrage utile aux jeune gens de l'un et de l'autre sexe. Description: Tours France, Mame et Cie 12th edition 1846 Copperplate frontis. . 138x87mm gilt cartonage romantique with pictorial vingette to front cover (edges & gilt rubbed ends of spine worn vignette very darkened). Prize bookplate of Institution de Mlles Tucker a Calais to Helena Gower and ownership name Agnes Gower to pastedown, 180pp. Contents clean and tight. *Not in Gumuchian and no author given but Preface remarks that it was originally not intended for general publication but printed in a small number for friends & family and some for sale in aid of charity.